Apple’s AirPower may be nowhere to be found, but that doesn’t mean you can’t charge two devices at one time, something Cygnett has built a charge pad to help solve. The automagical technology that is wireless charging is really hard to stop using once you’ve been introduced to it, but it does come with a few caveats. For starters, most wireless chargers will only charge the one device at a time, with a small pad made for one device. If you have two devices sporting wireless charge technology, that means one will need to wait its turn. But if you have two pads, well, that’s another story altogether. 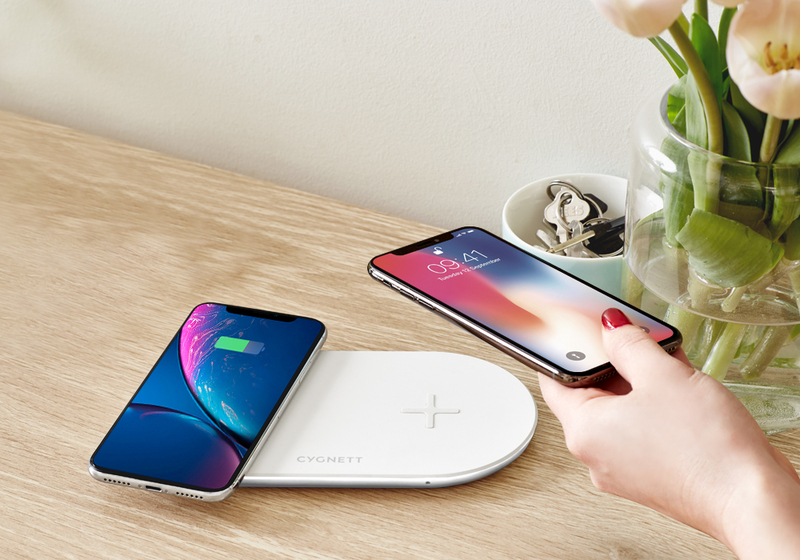 As the name suggests, Cygnett’s 20W Dual Wireless Charger is exactly that: a wireless charging pad that supports up to two devices with an output of 20 watts in total. Cygnett didn’t exactly make the name hard to understand with this one, and that’s intentional as the device is fairly simple to work out. Looking at it, you can’t help but feel Cygnett found the middle ground between IKEA’s dual wireless charging pad made for its cable storage solutions while giving it a small smile of sorts. We’re seeing that almost human like smile on the surface of the pad, and chances are when we point it out, you will, too. The charge pads as two eyes, the Cygnett logo as a mouth. Hooray for robotic smiles! 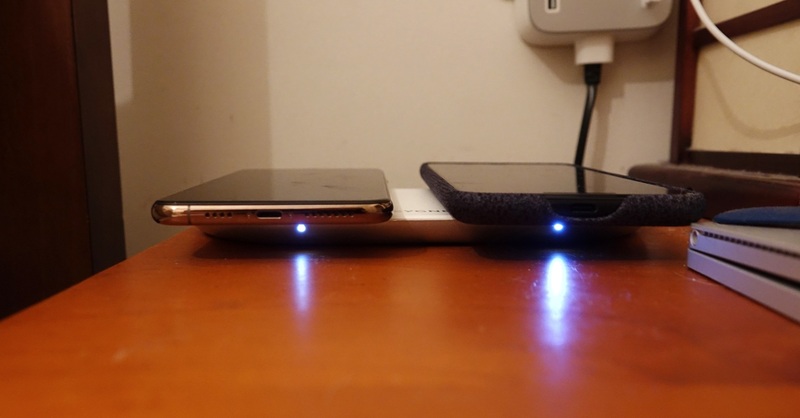 Unsurprisingly, Cygnett’s Dual Wireless Charger will charge two devices that support the Qi wireless charge standard, which includes a lot of phones released in the past few years. Samsung’s Galaxy S6 onwards including the S8 and Galaxy S9+, as well as Apple’s iPhone X, iPhone XR, the iPhone XS and iPhone XS Max, and both the iPhone 8 and iPhone 8 Plus, and a whole heap of others, too. Google’s Pixel 3 and Pixel 3 XL are included in that bunch, as is Huawei’s Mate 20 Pro, plus LG’s recent phones, as well. 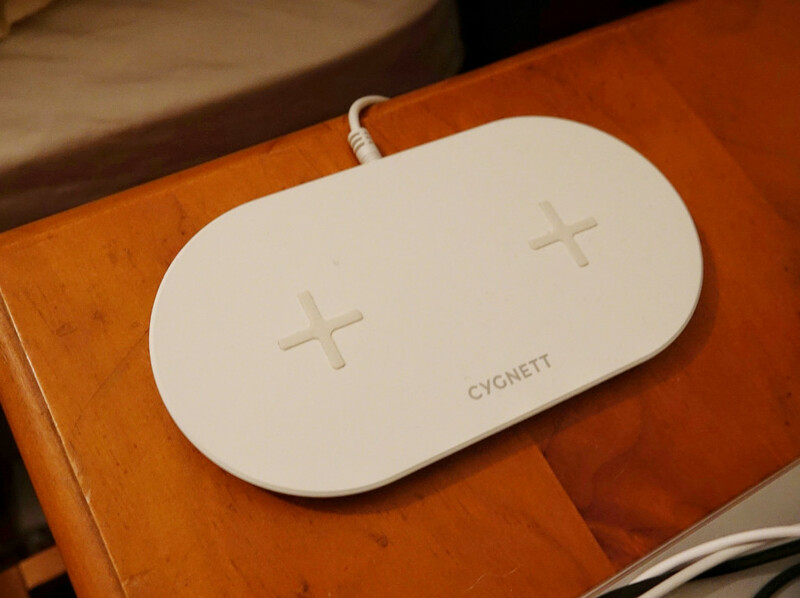 While Cygnett’s wireless charger will take two devices, those devices have to be phones. 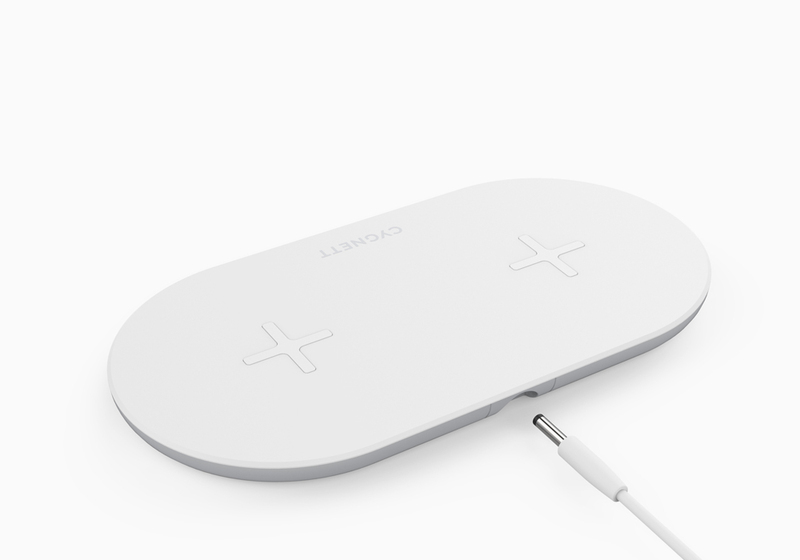 Wearables that do wireless charging will not charge on this pad, and neither will headphones. 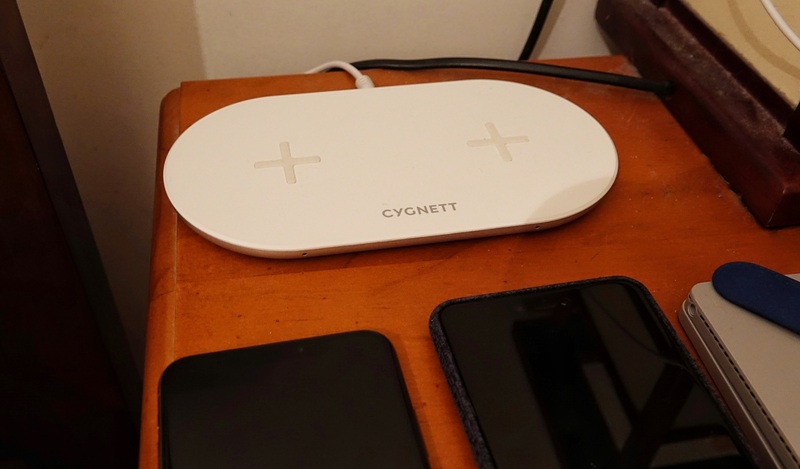 That means the Cygnett Dual Wireless Charger isn’t quite the Apple AirPower charge pad we’ve been promised for over a year, but it does deliver some of that. If you’re looking for a charger that wirelessly charges one or two devices, whether alone or at the same time, the Cygnett Dual Wireless Charger does exactly what it says. You can’t spread one phone across both charge sections and expect a faster charge, though, so don’t try. It doesn’t work. But the Cygnett Dual Wireless Charger does exactly what it says it should, even if we feel a few things could be added. For instance, a USB port would be nice, and handy if you wanted to clean up the amount of cables on your bedside or desk, and hang off your wearable’s recharge cable or dock, or even something for those earphones. Likewise, it would have been nice if Cygnett had opted for a USB connection to charge from. As it is right now, Cygnett’s Dual Wireless Charger plugs in with a small brick, which means it’s yet another cable you’ll have to bring that isn’t quite standard. Left alone by the side of the bed, this niggle won’t bother you, but given the world is moving to USB Type C, we’d have preferred that sort of connection. You also may find that the charging doesn’t quite work the way you expect it to, though this seems to be more related to where you leave the phone. Align the phone on the pad with roughly the middle of the phone, and once it’s working, not only will your phone give you an indication by telling you it’s charging, but Cygnett will light up a small white LED telling you the same. And good news: the small white LEDs aren’t super bright, so unlike some of the glowing blue rings other wireless chargers offer, you are able to get some sleep while they stay on! Coming in with a price of $129.95, Cygnett’s Dual Wireless Charger arrives at a premium over other wireless charging pads, something that secondary charge pad seems to deliver, aside for another place to wirelessly charge. These days, wireless chargers for one phone can be had for around $30-40, so the added bonus of two would bring the cost up to around $100 overall. For that reason, the dual wireless charger isn’t too far over the expected price point, but it is over one all the same. That said, we think it’s acceptable value, though the Cygnett Dual Wireless Charger is made for someone who needs to charge two phones at once. That might be yours and your partners, or the two you normally carry around. If those are your needs, you may find Cygnett’s Dual Charger is made for you.